In Part 1 of this series on app discovery, we discussed using machine learning to gain a deeper understanding of the topics associated with an app, in order to provide a better search and discovery experience on the Google Play Apps Store. In this post, we discuss a deep learning framework to provide personalized recommendations to users based on their previous app downloads and the context in which they are used. Providing useful and relevant app recommendations to visitors of the Google Play Apps Store is a key goal of our apps discovery team. An understanding of the topics associated with an app, however, is only one part of creating a system that best serves the user. In order to create a better overall experience, one must also take into account the tastes of the user and provide personalized recommendations. If one didn’t, the “You might also like” recommendation would look the same for everyone! Discovering these nuances requires both an understanding what an app does, and also the context of the app with respect to the user. For example, to an avid sci-fi gamer, similar game recommendations may be of interest, but if a user installs a fitness app, recommending a health recipe app may be more relevant than five more fitness apps. As users may be more interested in downloading an app or game that complements one they already have installed, we provide recommendations based on app relatedness with each other (“You might also like”), in addition to providing recommendations based on the topic associated with an app (“Similar apps”). Suggestions of similar apps and apps that you also might like shown both before making an install decision (left) and while the current install is in progress (right). One particularly strong contextual signal is app relatedness, based on previous installs and search query clicks. As an example, a user who has searched for and plays a lot of graphics-heavy games likely has a preference for apps which are also graphically intense rather than apps with simpler graphics. So, when this user installs a car racing game, the “You might also like” suggestions includes apps which relate to the “seed” app (because they are graphically intense racing games) ranked higher than racing apps with simpler graphics. This allows for a finer level of personalization where the characteristics of the apps are matched with the preferences of the user. To incorporate this app relatedness in our recommendations, we take a two pronged approach: (a) offline candidate generation i.e. the generation of the potential related apps that other users have downloaded, in addition to the app in question, and (b) online personalized re-ranking, where we re-rank these candidates using a personalized ML model. The problem of finding related apps can be formulated as a nearest neighbor search problem. Given an app X, we want to find the k nearest apps. In the case of “you might also like”, a naive approach would be one based on counting, where if many people installed apps X and Y, then the app Y would be used as candidate for seed app X. However, this approach is intractable as it is difficult to learn and generalize effectively in the huge problem space. Given that there are over a million apps on Google Play, the total number of possible app pairs is over ~1012. To solve this, we trained a deep neural network to predict the next app installed by the user given their previous installs. Output embeddings at the final layer of this deep neural network generally represents the types of apps a given user has installed. We then apply the nearest neighbor algorithm to find related apps for a given seed app in the trained embedding space. Thus, we perform dimensionality reduction by representing apps using embeddings to help prune the space of potential candidates. 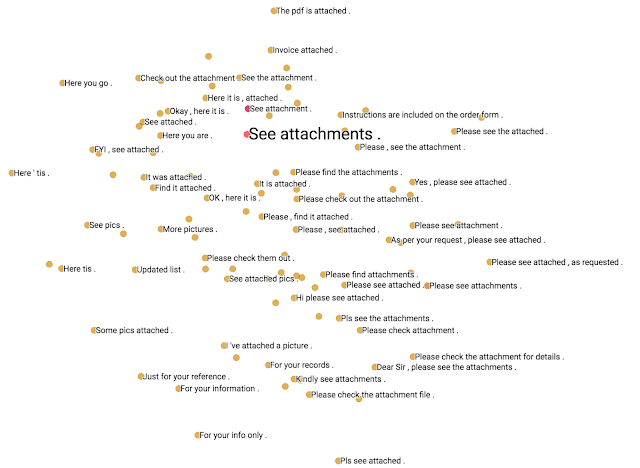 The candidates generated in the previous step represent relatedness along multiple dimensions. The objective is to assign scores to the candidates so they can be re-ranked in a personalized way, in order to provide an experience that is crafted to the user’s overall interests and yet maintain relevance for the user installing a given app. In order to do this, we take the characteristics of the app candidates as input to a separate deep neural network, which is then trained with real-time with user specific context features (region, language, app store search queries, etc.) to predict the likelihood of a related app being specifically relevant to the user. One of the takeaways from this work is that re-ranking content, like related apps, is one of the critical ways of app discovery in the store, and can bring great value to the user without impacting perceived relevance. Compared to the control (where no re-ranking was done), we saw a 20% increase in the app install rate from the “You might also like” suggestions. This had no user perceivable change in latency. In Part 3 of this series, we will discuss how we employ machine learning to keep bad actors who try to manipulate the signals we use for search and personalization at bay. 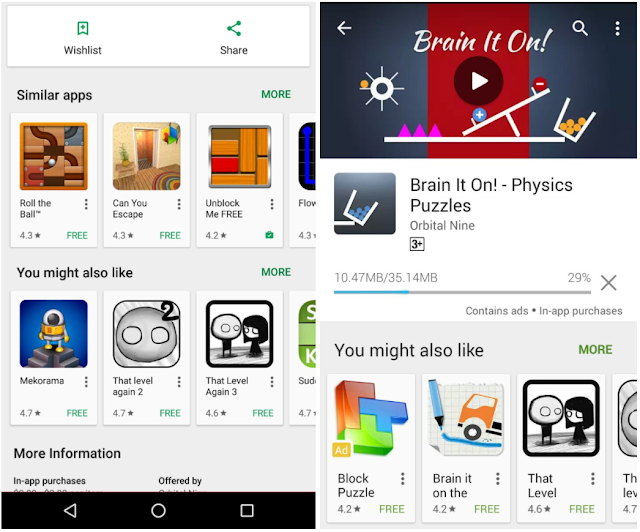 This work was done within the Google Play team in collaboration with Halit Erdogan, Mark Taylor, Michael Watson, Huazhong Ning, Stan Bileschi, John Kraemer, and Chuan Yu Foo. Recent advances in Machine Learning (ML) have shown impressive results, with applications ranging from image recognition, language translation, medical diagnosis and more. With the widespread adoption of ML systems, it is increasingly important for research scientists to be able to explore how the data is being interpreted by the models. However, one of the main challenges in exploring this data is that it often has hundreds or even thousands of dimensions, requiring special tools to investigate the space. 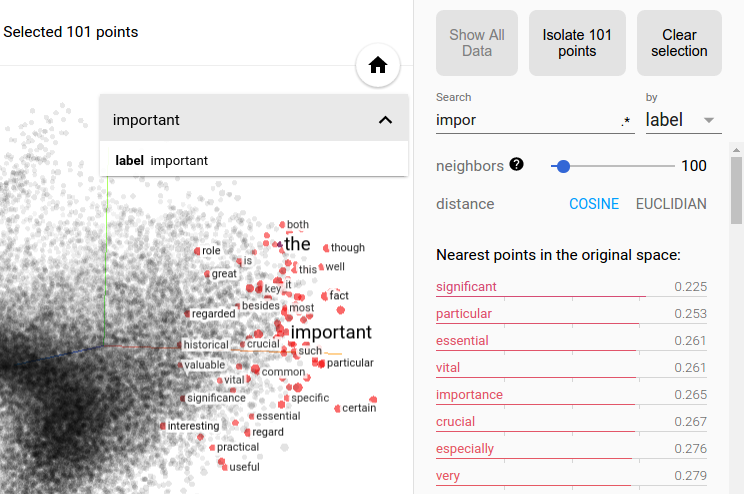 To enable a more intuitive exploration process, we are open-sourcing the Embedding Projector, a web application for interactive visualization and analysis of high-dimensional data recently shown as an A.I. Experiment, as part of TensorFlow. We are also releasing a standalone version at projector.tensorflow.org, where users can visualize their high-dimensional data without the need to install and run TensorFlow. The data needed to train machine learning systems comes in a form that computers don't immediately understand. To translate the things we understand naturally (e.g. words, sounds, or videos) to a form that the algorithms can process, we use embeddings, a mathematical vector representation that captures different facets (dimensions) of the data. For example, in this language embedding, similar words are mapped to points that are close to each other. With the Embedding Projector, you can navigate through views of data in either a 2D or a 3D mode, zooming, rotating, and panning using natural click-and-drag gestures. Below is a figure showing the nearest points to the embedding for the word “important” after training a TensorFlow model using the word2vec tutorial. Clicking on any point (which represents the learned embedding for a given word) in this visualization, brings up a list of nearest points and distances, which shows which words the algorithm has learned to be semantically related. This type of interaction represents an important way in which one can explore how an algorithm is performing. The Embedding Projector offers three commonly used methods of data dimensionality reduction, which allow easier visualization of complex data: PCA, t-SNE and custom linear projections. PCA is often effective at exploring the internal structure of the embeddings, revealing the most influential dimensions in the data. t-SNE, on the other hand, is useful for exploring local neighborhoods and finding clusters, allowing developers to make sure that an embedding preserves the meaning in the data (e.g. in the MNIST dataset, seeing that the same digits are clustered together). Finally, custom linear projections can help discover meaningful "directions" in data sets - such as the distinction between a formal and casual tone in a language generation model - which would allow the design of more adaptable ML systems. The Embedding Projector website includes a few datasets to play with. We’ve also made it easy for users to publish and share their embeddings with others (just click on the “Publish” button on the left pane). It is our hope that the Embedding Projector will be a useful tool to help the research community explore and refine their ML applications, as well as enable anyone to better understand how ML algorithms interpret data. If you'd like to get the full details on the Embedding Projector, you can read the paper here. Have fun exploring the world of embeddings! This week, Barcelona hosts the 30th Annual Conference on Neural Information Processing Systems (NIPS 2016), a machine learning and computational neuroscience conference that includes invited talks, demonstrations and oral and poster presentations of some of the latest in machine learning research. Google will have a strong presence at NIPS 2016, with over 280 Googlers attending in order to contribute to and learn from the broader academic research community by presenting technical talks and posters, in addition to hosting workshops and tutorials. Research at Google is at the forefront of innovation in Machine Intelligence, actively exploring virtually all aspects of machine learning including classical algorithms as well as cutting-edge techniques such as deep learning. Focusing on both theory as well as application, much of our work on language understanding, speech, translation, visual processing, ranking, and prediction relies on Machine Intelligence. In all of those tasks and many others, we gather large volumes of direct or indirect evidence of relationships of interest, and develop learning approaches to understand and generalize. If you are attending NIPS 2016, we hope you’ll stop by our booth and chat with our researchers about the projects and opportunities at Google that go into solving interesting problems for billions of people, and to see demonstrations of some of the exciting research we pursue. You can also learn more about our work being presented at NIPS 2016 in the list below (Googlers highlighted in blue). Google is a Platinum Sponsor of NIPS 2016.